General Takamori’s army is pushing up the eastern coastline of Kyushu. He’s taken Hyuga and Bungo in a lightning campaign, and after weathering a harsh winter in Bungo his army has marched further northwards to take Buzen. The Tsuwano, however, have other ideas. 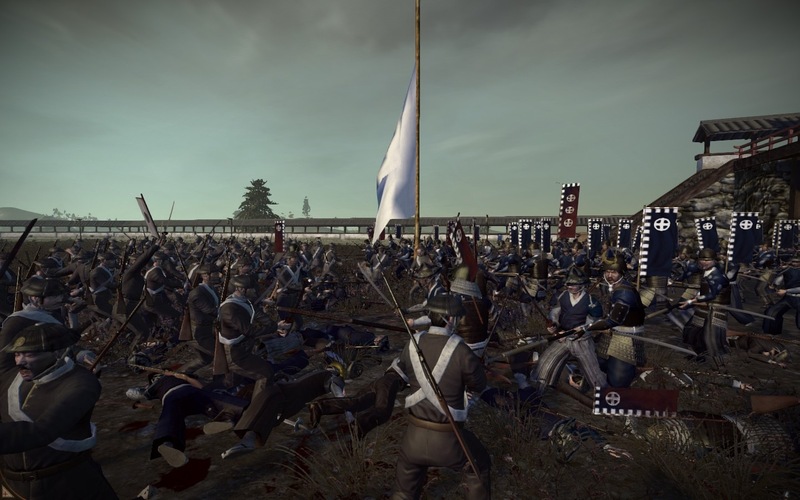 Buzen is garrisoned by 2600 men; mostly spear and musket levies, but they still outnumber Takamori’s small force of 1200 professional line infantry and sharpshooters by more than two to one. Takamori is forced into a desperate defensive action, where the attacking spear levies tie up the line infantry in close combat while the muskets pound, pound, pound away with massed fire. The line is close to buckling. Things are desperate enough that Takamori is forced into a course of action that Wellington would find displeasing: he orders his sharpshooters to start sniping at the enemy commander. Apparently unsettled by having five-sixths of his hatamoto gunned down in under thirty seconds, the opposing general flees taking most of his army with him. It’s a pyrrhic victory, however, as every unit that was on the main line of battle has come out of it completely gutted with less than half of its men remaining. Takamori is forced to withdraw from the siege and retreat back to Buzen to rest and rearm. Late summer, 1865: Second battle of Buzen. Takamori’s force has reinforced itself to a strength of 1800 and ventures back up the road towards Buzen. Unfortunately the Tsuwano have likewise reinforced; Takamori is now facing a gargantuan army of 4500 men. After crushing the Tsuwano fleet in a pitched naval battle around the straits of Hyuga Admiral Sukena is now in a position to provide Takamori with some naval fire support, but without explosive shells the salvos prove ineffective, killing barely fifty of the enemy. Takamori’s ground forces retreat from the battlefield without firing a shot. Spring, 1866: Third battle of Buzen. Takamori makes his third attempt to take Buzen, and this time he isn’t messing around. His army is now supported by cavalry and cannon; the supporting fleet of Admiral Sukena has doubled in size and is now equipped with explosive shells. The peasant levies of the Tsuwano are scattered by shot and shrapnel, and the fleeing survivors are put to the sword by sabre cavalry. After over a year of warfare, Buzen has fallen. This little saga neatly sums up Fall of the Samurai. 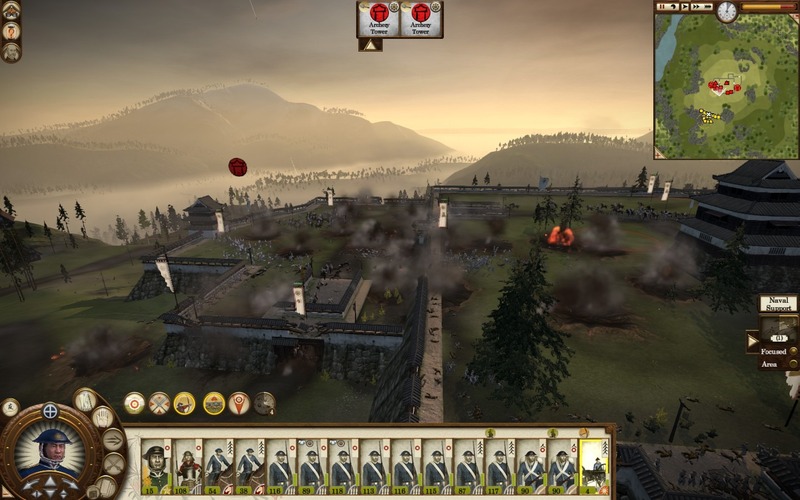 It’s an outstanding game, combining the best features of Shogun and Napoleon while adding not a few new elements itself, and one of the results is that cannon and fleets are no longer an interesting sideshow used for cracking forts and blockading ports. Instead they’re an absolutely essential part of your war machine, with combined arms being a practical necessity if you want to win battles against traditional samurai armed with sword and bow, never mind an opposing modern army. It’s the first time I’ve played a Total War where everything was so smoothly integrated. There’s nothing that feels vestigial or unnecessary; no merchants sitting on trade nodes for fifty years, no collection of generals languishing back at your capital because they’re too old to fight, no useless technologies you have to research before getting to the good stuff. Everything is streamlined. Everything is useful. Everything works. It’s probably best to start by describing how the technology tree has changed, because it’s not really a tech tree any more – more of a collection of tech sticks. There’s still some interdependency between certain branches of development, but for the most part you’re able to skip straight to researching a line of technologies which gives you better guns or better farms without having to waste time improving your geisha first. Of course it’s not quite as simple as that; the main factor determining what you can and cannot research is no longer how many techs you’ve already got. Instead, your clan is assigned a modernisation level. You start out at modernisation level one, and by building modern buildings and researching modern techs you can increase it up to level four. Each new level grants you access to new tech branches as well as a research rate bonus, but it will also give you a clan-wide unhappiness penalty as your people resent the rapid changes to the way they live. It’s not massive, and I have to say it’s not something I particularly noticed when I was playing the game on Normal, but on Hard it does make a difference, with most of my heavily-policed cities teetering on the border between barely-contained surliness and outright revolt. Making these changes to something which lies at the fundamental root of the game has had knock-on effects for how the rest of it plays. For example, as it is now possible to research a specific naval branch of the tech tree without faffing around researching pointier sticks first (or whatever), the naval arms race that so dominated late 19th century Europe becomes a pressing concern in Japan as well. Fleets can now do much more on the campaign map; their cannon give them the ability to bombard enemy armies and province improvements inland as well as providing fire support to friendly armies that are in range. This makes a powerful fleet not just useful but practically indispensible — especially since the AI is now much better at using its own fleets to harass your provinces and land armies in your rear – and with researched techs giving you access to copper- and iron-plated ships, explosive and armour-piercing shells, and torpedoes, having the tech edge here can easily make all the difference between campaign victory or campaign defeat. It helps that the Creative Assembly have really outdone themselves with the naval battles this time around. All of the ship models are absolutely gorgeous, from the adorable little gunboats to the numerous corvette classes to the hulking, brutal Kotetsu ironclad. The battles themselves are chaotic but satisfying; the mark of a good naval commander would be whether or not they can keep their fleet together and their fire focused. 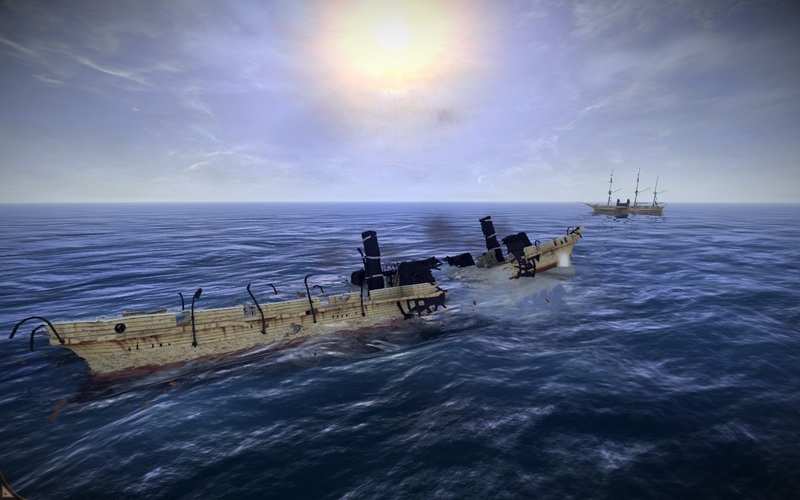 I can’t do this, and so my battles tended to start with my fleet splitting to try and catch the enemy fleet in a withering crossfire before devolving into a series of individual ship-to-ship melees punctuated by the odd spectacular explosion as somebody’s ammunition magazine ignited. The armour and ammunition really does make a difference, as well; while a copper-plated ship will still succumb to a concentrated barrage from three or four wooden ships, its extra armour will allow it to get into range to fire explosive shells that will set the wooden ships on fire, which spells doom for any ship that doesn’t drop everything and focus all of its efforts on putting the fire out. And of course the Kotetsus come with several gatling guns mounted on their central tower which can literally saw a wooden ship in half. The modern era and the rapid pace of development means that technology matters, more than it ever has before. On land the dichotomy between modern versus traditional is a little less pronounced, although it does exist. While rifle-equipped infantry has the ranged firepower you’d expect, traditional samurai units armed with melee weapons are absolutely murderous in close combat. A basic peasant spear levy unit has the same melee stat as line infantry. One unit of yari kachi will effortlessly chew through and rout two units of line infantry without taking significant losses themselves. I started to dread defensive castle sieges against attacking samurai; while my guns would make the enemy forces pay dearly for climbing the walls, once they were inside the tables would turn and my rifle troops would be massacred. AI armies fielding traditional troops seek to close with you as quickly as possible to make the most of their melee advantage, and so battles really do become a matter of routing the enemy army before they rout you. If you just slug it out on a 1:1 basis then, sooner or later, you will lose. As your technology level progresses, though, the basic advantage traditional units have begins to vanish. The higher levels of rifle-equipped troops such as Shogunate infantry or the Imperial Guard have a melee stat that equals or exceeds that of basic samurai kachi, and while the elite samurai troops remain pre-eminent in close combat it’s an advantage that is almost completely nullified by the advent of cannon. You start the game with the ability to build wooden cannon (yes, apparently these were a real thing) which are only good against fortifications, but you can tech up to Parrott guns and Armstrong guns – think classical 19th century artillery pieces – which fire explosive shells as a matter of course but which also have a deadly shrapnel shell ability. 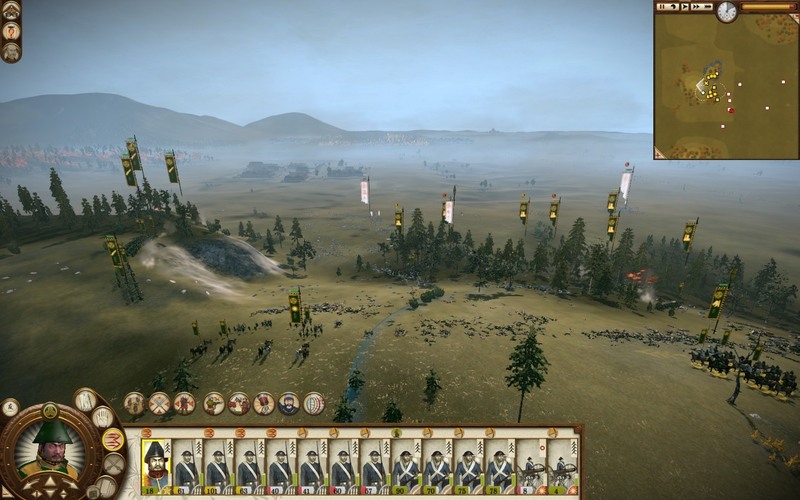 Two or three batteries can easily tear the heart out of a charging samurai army, and when you add in the new naval bombardment ability – which scales in area of effect and number of shells fired with the number of ships in the supporting fleet — the amount of firepower you can concentrate into a single area becomes truly ridiculous. Finally there’s gatling guns, which are the holy grail at the end of the rifle tech branch, and which act as a kind of short-range Samurai-B-Gone. 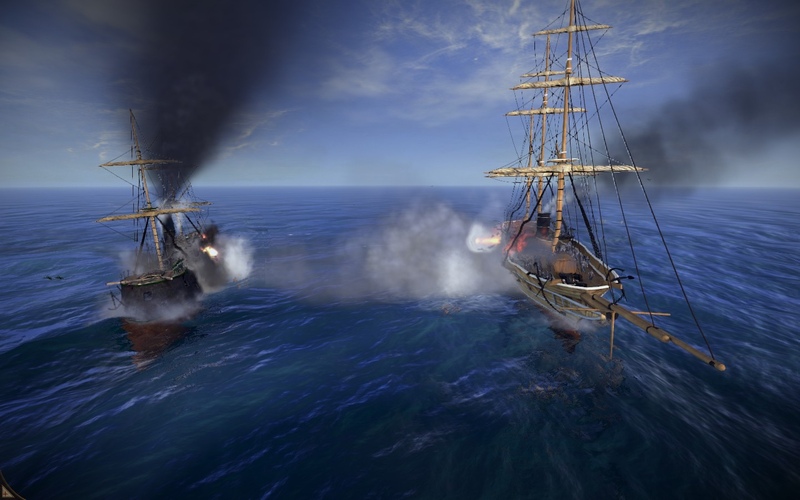 I can see traditional armies remaining viable throughout the game as long as they too utilised cannon and naval bombardments, but it would definitely be a harder option. 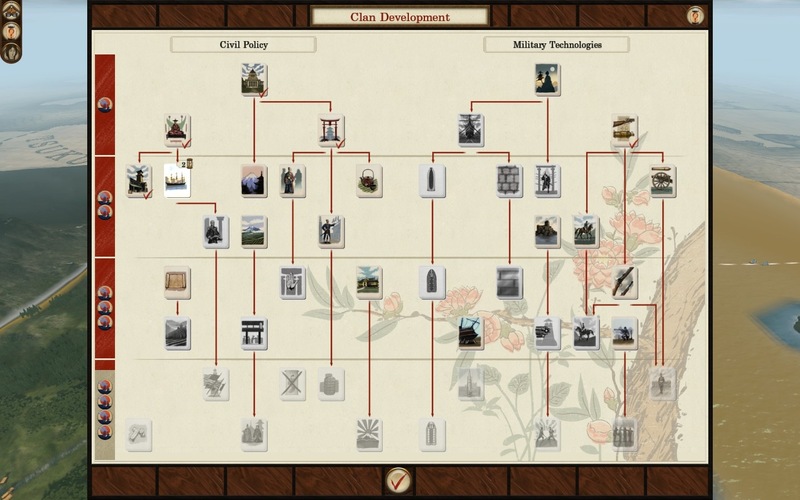 These improvements in battlefield technology and battlefield fighting are mirrored by numerous economical and political improvements on the empire map. By far the biggest one is that the original game’s Realm Divide mechanic that so infuriated me is dead and buried (or at least rendered entirely optional). Instead the country is split into pro-Imperial and pro-Shogunate provinces, and pro-Imperial and pro-Shogunate clans. Having the same allegiance as another clan gives you a big boost to your diplomatic relations with them; conversely a different allegiance will make them hate you. This has the effect of giving you some neighbours who will always – at least broadly – be on your side as fellow members of the pro-Shogun/Imperial bloc. The allegiances aren’t set in stone, and clans can switch allegiance from one side to another as the campaign progresses; having a nearby clan that you thought was loyal suddenly announce that they support the Shogun can really throw a spanner in the works. If you take a province from a clan which supports the other side you have to spend some time “convincing” the population to come around to your way of thinking (a process which can be sped up by the Ichin-Ishii/Shinsengumi police agents), and until you do that province will suffer a large happiness penalty. The fame bar is still present, and eventually you’ll take enough provinces that you’ll max it out. This is the point where the chips are down, the die is cast, and other such hoary old cliches. You’re given a choice; either you declare for the Shogun/Emperor, in which case the alliance of pro-Shogun clans will fight it out with the alliance of pro-Imperial clans for control of Japan, or you declare that you’re forming a Republic, which is basically Realm Divide redux and makes everyone hate you. I find this to be a far more natural way of dealing with the political side of things, and it’s one that reflects the actual events of the day; the Boshin war was not fought between individual clans but rather individual factions. Unfortunately while it is certainly better than what we had before, it’s some way short of being ideal, with the biggest problem being that the Shogunate/Imperial struggle is largely out of your control. In my first game the Shogunate faction became pre-eminent without any intervention from myself, and I actually found it quite difficult to get the provinces needed for victory because everyone around me was pro-Shogun and thus showed up as Very Friendly in the diplomatic interface. 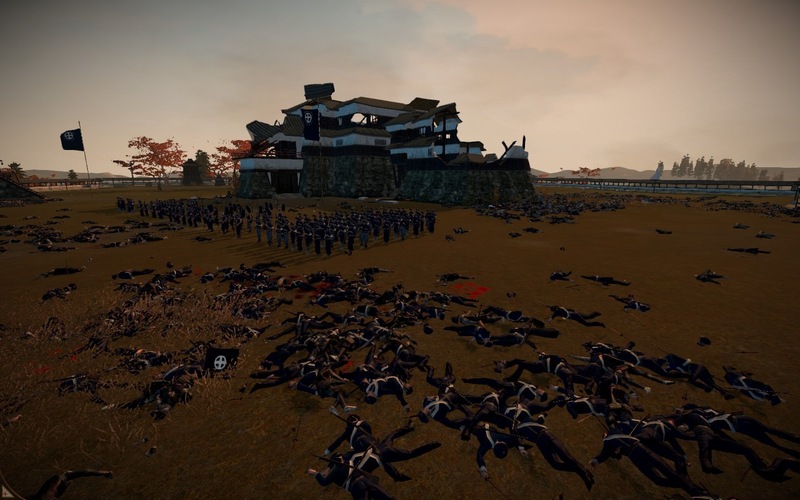 In the second the Shogunate faction went even further and actually eradicated most of the pro-Imperial factions three years into the game, except this time I myself was pro-Imperial and found myself facing an uphill struggle through no fault of my own. Of course I didn’t have to live with this — I could have just switched my own allegiance to the winning side, but I think that would have been more than a little bit unsatisfying. So it’s a decent effort, CA, but it could do with a little more fine-tuning and refinement when you adapt it for your next title. The last thing to talk about is agents. Thanks to the way agents levelled up in Shogun 2, and thanks to the way most of their abilities were active abilities requiring large sums of money to carry out, I found myself using just one super-ninja since only he had the experience to make the odds of success worth the investment of resources. Levelling up others would have required many failed assassination attempts and much wasted money, and while other agents could level up passively through boosting your town/province attributes the rate at which they did so was painfully slow. There was also the minor problem that any agents (or generals) who started out in middle age would eventually die from natural causes before the game was finished, making me less likely to invest time and effort levelling them up. These are issues that I think have almost entirely disappeared from Fall of the Samurai. The game takes place over a much shorter 10-15 year period, meaning old age is a non-issue. The new agents – the secret policeman (combination monk/police/ninja), the geisha (monk/geisha) and the foreign veteran (some ninja attributes but mostly entirely new) – have new abilities, almost all of which are massively useful, and the passives are actually things you want them to be doing thanks to a much faster levelling system. For example, my spearhead army has all three agent types attached to it. The foreign veteran trains them on the march and makes reinforcement cheaper when they capture a town. The geisha boosts their morale. The secret policeman boosts their melee ability. Their individual skill trees give them further specific bonuses to the army as well. The north of my territory is littered with geisha and secret policemen, improving the productivity of my major money-producing towns and keeping the population loyal. The only reason I don’t have more foreign veterans is because I don’t have the trading port network to support them. All three types are immensely useful and I’ve maxed out the agent limit on each one because my empire can’t get by without them. These improvements – and others – make Fall of the Samurai the Total War game I’ve always wanted to play. It all seems so much more fluid and natural than even the perfectly-serviceable Shogun 2. This being the CA, though, the game is not without its issues. Ship AI is bugged, with enemy fleets occasionally sailing into land en masse at full speed (I’d make more noise about this if it turned up more often and if hadn’t let me win a couple of crucial naval battles that looked hopeless). Coastal defence battles are also a bit iffy, with one of my fixed-position coastal batteries being situated just behind a small hill which blocked every shot they fired and rendered them utterly useless. Probably the biggest missed opportunity are the railways, though; as you’d expect they’re intended to speed up troop transport immensely, but the problem is the route the railway takes across Japan is fixed and will inevitably pass through a province controlled by an AI ally. You can negotiate military access with them which will let you use their railway, but this is a completely redundant feature because the AI never builds railways. This scuppers the entire idea of a railway network, as the best you can do with it is move your troops maybe two provinces before they have to disembark and continue the journey on foot. Hopefully they’ll fix that up in a patch; as it is it’s a tragic waste of one of the features I was most looking forward to. Regardless of these niggles Fall of the Samurai is a tour de force achievement for the Creative Assembly. They’ve distilled everything good about Total War into one game, and they’ve succeeded in filtering out most of the bad at the same time. If you like Total War at all; if you abandoned the series after the debacle that was Empire and you’re convinced that it can’t do guns properly; even if you are a Jim, you owe it to yourself to get this game. I suspect it may be the most fun I have with a PC game this year, and I say that knowing that, after a rather slow start, 2012 is shaping up to be an absolute corker with Diablo III, Heart of the Swarm and a whole host of promising Kickstarter-funded indie games on the horizon. Despite their likely quality, Fall of the Samurai is so good it may end up eclipsing them all. That has always been CA´s biggest problem, they could never make diplomacy something natural, logical and pleasant. Whenever you play hard modes, you can be sure the game will always, one way or another, set you up completely. And CA could also never develop a proper hard level; it is either too hard ( hard modes ) or easy-medium ( medium ). An ideal hard level mode would be one where AI would have more money, research faster and produce tough troops, and that is it. I will never understand the reason why CA always have to completely destroy diplomacy and send everyone to attack the human player simply because you set the game on hard and not medium. Fall of the Samurai is the closest they’ve gotten to the ideal, but it only manages this because it artificially organises sets of clans into two opposing blocs. In this one case it’s acceptable because it reflects the era, but in terms of gameplay it’s not particularly exiting. What I would like is for multiple blocs of clans to arise naturally and organically, and for the human player to be able to become part of one of these blocs giving them a set of AI players they can trust (within reason). I don’t want to be fighting every other player in the game. Two-thirds, maybe. But not all of them. After playing four (!) campaigns, I’m currently in the midst of a love-hate relationship with Fall of the Samurai. I prefer its period to the base game’s, and its tactical battles, at their best, are superb. On the other hand, its campaign just doesn’t seem anywhere near as tightly designed, and a great battle system is meaningless when 90% of the time, the AI just flings hordes of peasant levies at me. How have you found the AI’s army composition? I’m in partial agreement with anonymous above about the difficulty levels in CA games. I agree that, for Fall, “normal” is on the easy side while “hard” is brutal due to the AI’s aggressiveness (and CA’s new policy of making everything more expensive on “hard”!). However, I thought the difficulty was just right for the base game. You know, I can’t say that’s a problem I’ve ever particularly noticed. Certainly the AI does fling hordes of peasant levies at you but that just makes encountering a full army of professional soldiers or samurai a really nasty surprise, and the AI fields enough of those to make things a challenge. The peasant levies can occasionally be nasty too if they outnumber you two to one because their awful accuracy doesn’t matter so much when there’s two thousand of them all firing at your lines. Normal difficulty is just a little bit too easy for me. I have more fun on Hard, but the weight of crap I have to deal with eventually mounts up to the point where I give up. Now, Normal is fine if I don’t want to think too much about what I’m doing, kind of like playing a game of Civ IV on Noble, but the gulf separating it and Hard is just too big. It’s probably the number one thing I’d say they have to look at for their next game — balancing their difficulty levels so that Hard is challenging, but not ridiculous.